It is a concept and a word that has shaped politics worldwide for decades, all the more since September 11: terrorism. But what does "terrorism" really mean, actually? And how well do most people understand it? Not very, it seems. Over the past year, in the face of last August's white supremacist rallies in Charlottesville and subsequent death of Heather Heyer, the mass shooting in Las Vegas last October, and multiple school shootings, people have increasingly taken to social media to demand that such episodes be declared terrorism. And while the Charlottesville killing has been treated as a terrorist incident, the others have not – often to the frustration of far left activists, so-called "millennials," and others. Now the recent serial bombings in Austin, Texas, have raised the issue once again. On Twitter, discussions have broken out questioning descriptions of bomber Mark Anthony Conditt, who killed himself by detonating an explosive while being pursued by police, as "troubled" rather than as a "terrorist." This, the argument goes, is because he was white. Muslims are never described as "troubled"; they are immediately declared terrorists. In fact, this has never been the case. When Army psychiatrist Nidal Hassan went on a shooting rampage at the Fort Hood military base, killing 13 and injuring more than 30, the incident was long officially described as "workplace violence," even after it was revealed that Hasan had ties to known terrorists, including American-born al-Qaida ideologue Anwar al-Awlaki. And although Pulse nightclub shooter Omar Mateen pledged his allegiance to ISIS while killing 50 and injuring more than 50 more, he was regularly described by law enforcement and the press as being "mentally disturbed" or "bipolar." The BBC reported that "it was not clear whether the attack was a case of domestic or international terrorism." Yet while law enforcement has stated no evidence connects the Austin bombings with terrorism, even media pundits have joined the outcry. Dean Obeidallah, for instance, penned an op-ed for Mediaite asking "How Many Bombs Does A Non-Muslim Need To Set Off Before Being Called A Terrorist?" And Joy Reid took to Twitter to ask where the "terrorist," who was raised in a religious Christian home, was "radicalized." Similarly, following last month's Marjory Stoneman Douglas school shooting in Parkland, Florida, social media filled with demands that the shooter, Nicholas Cruz, also be charged with terrorism. In both cases, the argument centered on the "terror" aspect of "terrorism": both men had instilled fear in large groups of people. Therefore, terrorists. 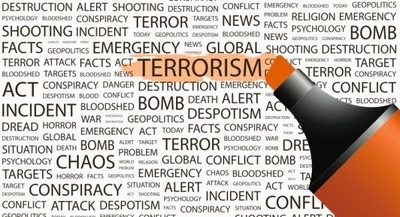 The term "terrorism" means premeditated, politically motivated violence perpetrated against noncombatant targets by subnational groups or clandestine agents. The unlawful use or threatened use of force or violence against individuals or property in an attempt to coerce or intimidate governments or societies to achieve political, religious or ideological objectives. While these official definitions vary, they hold in common the element of socio-political, ideological motives aimed at coercing or intimidating governments or entire societies. No evidence has yet tied the Parkland or Las Vegas shootings or the Austin bombings to ideology. This did not stop Obeidallah from mangling the definition. To the contrary, he claimed that the bombings "fulfill the definition under the federal law since Conditt clearly used his bombings to 'intimidate or coerce a civilian population'" – conveniently deleting the part about "furtherance of political, religious, or ideological objectives." What's more, just two days before Obeidallah published his accusatory rant condemning the failure call non-Muslims terrorists, trials began for three non-Muslim members of what NPR described as a makeshift, anti-government, anti-Muslim militia in Kansas. The men were arrested in 2016 for plotting to bomb an apartment complex and a mosque – a plot that was never realized – and now face terrorism charges. At least in this case, then, the answer to Obeidallah's question about the number of bombs a non-Muslim must set off to be declared a terrorist would be: "zero." Law enforcement agencies have also been clear in the past year or two that the white supremacist threat facing America is growing swiftly – an analysis that has received a good deal of media attention. Increasingly, counter-terrorism focus has been explicitly on white men, not Muslims, a fact that challenges Obedeillah's and others' claims. Others would also prefer to expand the definition of "terrorism" to include other crimes. If terrorism is about violence aimed at coercing societies to achieve "ideological objectives," they insist, then hate crimes are terrorism. Not so, said Farhana Qazi, a former agent at the National Counter-Terrorism Center in Washington, D.C. and author of the forthcoming Invisible Martyrs: Inside The Secret World of Female Islamic Radicals. "Terrorists identify with an ideology to achieve a political goal. It's that simple," she wrote in an e-mail. "If there is no political goal and no religious motive, then it's not terrorism." While hate crimes can be terrorist-related, she said, they are not inherently terrorism. Indeed, hate crimes rarely have anything to do with coercing change. They are the expression of an individual hatred (or group hatred), even a desire to eradicate Jews or blacks or homosexuals from the earth. But they do not seek to "intimidate governments or societies to achieve political, religious or ideological objectives." For the same reason, Qazi also maintains that school shootings are not terrorism, and dismisses recent demands among some to declare the National Rifle Association a terrorist group. "School shooters are psycho- or sociopaths, and there are indicators for this behavior," she explained. "Many school shooters exhibit these behaviors – when has a school shooter been a radical Muslim? Or someone with a political goal? Or linked to ISIS or a foreign terror group? We can't mix the terms and place all crimes and violent acts into one category. That's a mistake." Why the urge to label such crimes "terrorism" has become the vogue in certain circles is hard to say. Is the notion of "mass murder" not horrific enough? Do the words "hate crime" fail to carry the same sense of dire urgency as "terrorism?" Or is it a fear that these issues will not be taken seriously enough otherwise? Or is it, perhaps, something else, a public need for a clear definition of terrorism, more precise than those currently in place? In one recent Twitter discussion, some pointed out that the United Nations hasn't even established a formal definition of the term. "So if they can't, then anything can be considered terrorism," the argument went: hate crimes, say, or the Austin bombings. But the UN confronts unique difficulties in defining "terrorism" that are not relevant to school shootings and hate crimes. Rather, the agency has faced disagreements among some member states as to whether violence is acceptable against foreign occupation – which is to say, whether Palestinian suicide bombers, for instance, are "terrorists" or "freedom fighters" – and so, whether their efforts to coerce a government in the furtherance of their objectives does or does not constitute terrorism. By contrast, there is no indication that Conditt or Cruz or Las Vegas shooter Stephen Paddock saw themselves as freedom fighters, liberators, warriors for a greater good. Still, these discussions may underscore a desire for a clearer understanding of what terrorism is – and of what it isn't. And they may indicate that a grieving, confused, and frightened public desperately needs to know that their fears and grief are being taken seriously, that "school shooting" and "mass shooting" and "hate crime" are terms that carry as great an impact as "terrorism." Those needs should be addressed – because misusing the concept of terrorism ultimately can be dangerous, Qazi believes. "Criminals – petty theft, drug dealers – should not be treated as terrorists," she said. "School shooters should not be treated like drug dealers. And so on. There are different kinds of crime, so we should be careful not to place every criminal act under the umbrella of terrorism. If you can't define the term, you won't be able to offer sound solutions to the problem. We can't counter the threat if we misplace it."